1.) Hey there Emily, admittedly we all have a bit of a sweet tooth here at Tryptic Press headquarters so we’re pretty excited to hear about the process of “art meets chocolate.” First off, though, tell us a little about where you’re originally from and the early influences that led you to a career as an artist. I grew up in a small town called Georgia, Vermont. It's in the northern part of the state; a place where you need to find ways to entertain yourself! For me, that was always art. In school, I loved reading books about Picasso, Chagall, and Lichtenstein. Those were some of my earliest influences. 2.) So you would later attend Montserrat College of Art focusing on a degree in illustration. Help us out here and connect some dots; how does an illustrator years later end up a nationally recognized sculptor? When did that leap arrive from creating 2D suddenly to 3D? I started off at Alfred University as a ceramics major. I could tell right away that I didn't exactly fit in. While other students were creating slab work, abstracts and thrown pieces with glazes, I was creating sculptures of people or animals, finished with acrylic paint. My professor said my work was too illustrative and recommend I transfer to another school. That's how I joined the illustration program at Montserrat College of Art. Unfortunately, once again, I found myself on the outside looking in. The program's focus was on 2D illustrations and that's never been my strong suit. I tried to adapt, but the end result was mediocre. For one of our 2D assignments I took a risk and tried a 3D piece instead. I'll never forget how nerve-wracking that critique was. In front of the class, there were paintings, drawings ... and my lonely air-dry clay sculpture. My professor, Fred Lynch, took one look at the piece and told me it was time to throw away my canvases and start focusing on illustrating with clay. My 3D illustration career was born (I haven't painted a canvas since). 3.) While “sculpting” relies on a 3D approach to creating, a large portion of your work incorporates painting & drawing over the chocolate. Even hand lettering appears to be vital to executing some of the more involved pieces. So from sketching out a design and painting the final details, is a traditional 2D approach to your work just as important to the final sculpted product? I still rely on plenty of 2D skills when creating chocolate sculptures. Each sculpture starts out as a sketched concept and I sometimes rely on templates as a guide when cutting out flat pieces of chocolate. The 2D pieces are then glued together (using liquid chocolate!) to create a 3D shape. Piping skills are one of the things I take the most pride in. Good piping is essential for beautiful details and legible writing. I've loved hand lettering since learning about in Natural Science illustration. When lettering in chocolate, I almost always use cursive because it flows better and doesn't allow the chocolate to glob up at a letter's natural stopping point. For color, I turn to cocoa butter. It's warmed to a liquid and natural colors are added before painting it onto the chocolate with a brush or airbrush. A good understanding of color theory and painting technique is important. 4.) Shaping and forming chocolate to build completely edible works of art clearly come with its own set of rules. The right temperature and density quickly come to mind. Are there moments of improvisation and just plain breaking the rules with whatever technique gets the job done? Give us some industry secrets. Working with chocolate has its own special challenges. For starters, it's very brittle. Luckily I had experience working with air dry clay, another fragile medium, in college. Chocolate has to be tempered before working with it. Tempering is a heating and cooling process that helps form the cocoa butter crystals, also known as beta crystals, that give chocolate a great shine, snap, and smooth texture. It's a challenging skill to master, but essential to making sculptures that are strong and won't bloom. Then there's managing temperature and humidity. In order to cut chocolate, it needs to have a "fudgy" texture --- dry enough that my knife comes out clean, but wet enough that it won't shatter while working with it. If the environment is too warm, the chocolate stays soupy and won't set up properly. On the flip side, if it's too cold I won't have enough time to cut out my shapes. Speaking of staying cool, I have to manage the temperature of my hands or risk leaving fingerprints all over my work. The last, and maybe most important challenge is accepting that things are going to break. It's just like air dry clay and in some cases, the breaks can turn into an even better piece. Mistakes can inspire creativity. 5.) From steam-punk to classic films and literature, a few constants with your work seem to be that it’s not only a creative outlet, but it’s also a whole lot of fun. While each job I’m sure comes with a bit of pressure and stress, all of your pieces feel created with equal parts sense of humor and genuine affection for the artistry. Is this some of your personality coming through just like any other work of art? 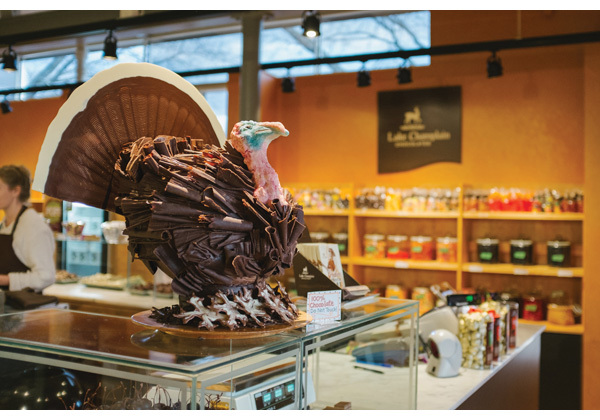 I'm fortunate that my employer, Lake Champlain Chocolates, gives me creative control over what I want to create. The only restrictions I have are for holiday-themed sculptures, otherwise, I'm allowed to be inspired by what I love. No matter what theme I choose, I try to maintain a consistent style. Whether it's a 3D chocolate sculpture or 2D clay piece, I want all my work to stand out as something I made. Chocolate is my favorite medium to work with! Nearly everyone loves chocolate and it never gets old seeing people take pictures with my sculptures or the surprised look on their faces when they find out it's 100% edible. I absolutely want people to eat the sculptures I've been commissioned to make! These sculptures aren't meant to last forever. 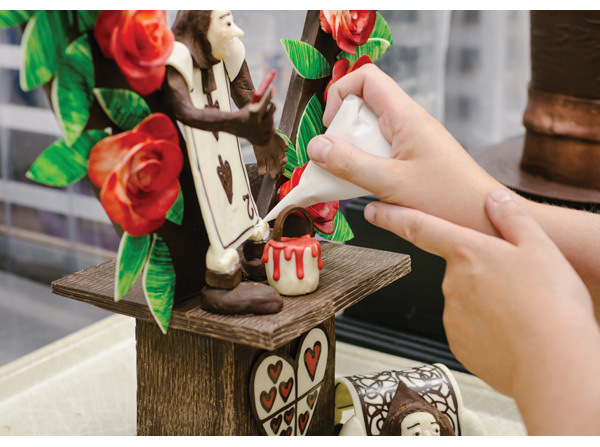 Chocolate art has a dual purpose --- enjoy its beauty, then enjoy its flavor. And while I'm working on something, I just make sure to keep plenty of other snacks around to resist any temptation! 7.) A quick visit to your website www.chocolatesculptress.com and readers will quickly learn you’re a rockstar in the world of chocolate. From features on the Food Network, hanging with Grace Potter and of course Vermont’s own Ben & Jerry, you’ve had a pretty crazy career already. What’s been the most exciting or fulfilling moment for you so far professionally? Since I started this chocolate journey, my goal has always been to be on the Food Network. It took 13 years to get there, but it's certainly one of my greatest accomplishments. I was really lucky for that opportunity, but it went by too fast. I really hope to do it again! 8.) If we can get serious for a minute, in a perfect world, chocolate is just a means to build robots right? Of course! I was just thinking it's been too long since I made Chocobots. 9.) Okay, give our readers out there an artist you think they should know more about. Anyone you just love that we should all follow? Musician, illustrator, or even some rival chocolate sculptress? The work being done at the “Cacao Barry World Chocolate Masters” is simply mind blowing! Every year they come up with a new theme and the show-pieces are a true inspiration. They make me want to work harder! 10.) So finally let us know what we can expect to see next from you; any future client or project we can be on the lookout for? I always want my next sculpture to be better than the last. 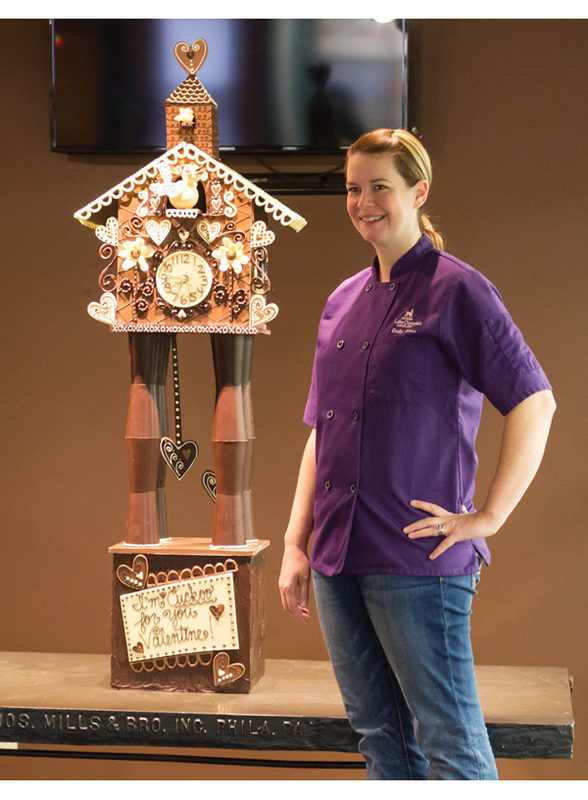 One way to achieve that “wow” factor is with bigger pieces, but as they grow chocolate sculptures become more difficult to manage. Ultimately, I just want to break the mold (pun intended) in the world of chocolate sculptures. I've never created what would commonly be considered a “traditional showpiece” and that's intentional. Maintaining my own style is most important.